This is a Focal Point Series book of which Gene Edward Veith, Jr. is the general editor. 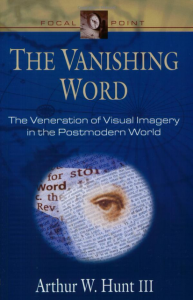 The subtitle of the book is “The Veneration of Visual Imagery in the Postmodern World.” Hunt takes the reader from the world of the Scriptures, given in verbal form, to the Reformation and then to the modern day. He shows how we have gone from a print society to an image-driven society. The danger has been, and is today, that idolatry is image driven and today’s culture is totally immersed in image. Along the way Hunt gives many interesting historical anecdotes about the coming of the new inventions that produced the industrial age and then the information age. Hunt follows Neil Postman closely and also Veith. Postman’s books (Amusing Ourselves To Death, Technopoly, etc.) and Gene Veith’s books (Postmodernism Today, Reading Between The Lines, etc.) have been among many that are warning us about the downside of Postmodernism.